Corner fireplace. Smooth Kilkenny stone. Model presented with Clear 170 TS gas frebox. Custom-made fireplace 3 faces in C. Remote-controlled automatic combustion block with smartphone application. A wall-mounted fireplace occupies no floor space. The firebox and its housing project from the wall to which they are attached. Wall-mounted fireplaces are typically installed in a home's living room, though they may be placed wherever a flue can be installed. 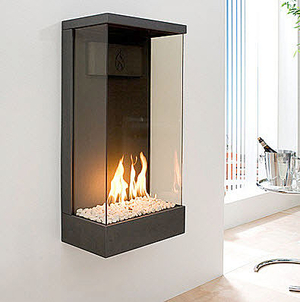 While gas and bioethanol fireplaces need no flue and consume little fuel, they produce only a modest amount of heat. Different models use wood, gas, bioethanol or electricity. The firebox can be open or closed. Intended use will determine fuel and firebox type. A wood-burning unit with a closed firebox is best for heating a room. If the goal is decorative, a bioethanol model with open firebox should be considered. Other factors include design and budget, since shapes, styles and prices vary greatly.